The Fountain, NC Peanut Festival, now in its 8th year, is a celebration of the community and a celebration of summer in North Carolina. The festival attracts approximately 5,000-7,000 guests each year and features quality entertainment and vendors. The event is held on the 3rd weekend of August each year. The festival is striving to gain the reputation as one of the preeminent community festivals in eastern North Carolina. Set amidst the charming small town atmosphere of the Main Street area of Fountain, the peanut festival offers a wide variety of activities and entertainment for every member of the family. Features include musical performances by local, regional, and national recording artists. This year's lineup features country music headliner, Natalie Stovall and the Drive as well as Nashville recording artist (originally from Greenville, NC) Kasey Tyndall, local favorites The Mikele Buck Band, Super Grit Cowboy Band, and more great local music to please everyone. Craft persons, artists and commercial firms come from far and near to display and offer their creations and products to festival goers. An extensive selection of foods are offered each year promising to offer something to tempt every palate. The festival also offers many special diversions for our younger guests, such family-oriented entertainers and amusement rides for all ages. The festival, with the exception of the amusement rides is offered entirely free of charge to our guests. 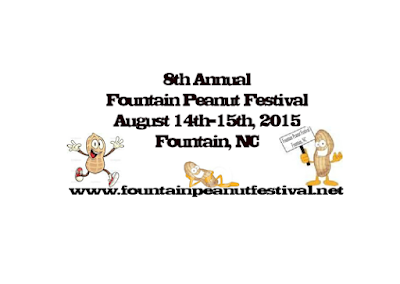 Come join us for some old fashioned, family oriented fun at the Fountain Peanut Festival.